Sound Audition was born after working with audio engineers in the heart of amish country (Lititz, PA). 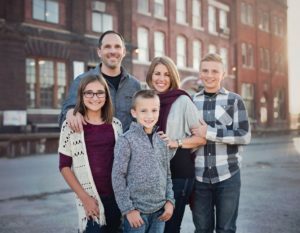 Currently living on the other end of the microphone in Kansas City, MO — I serve on staff at a local church (Pleasant Valley) with my wife Lisa and our three kids: Joshua, Kayla and Tyler. How do I invite others in my organization to take an audition? After you are logged into your account, use the “Invite” tab located on your main audition page. You only need a person’s name and email address to send them an audition. An email will be sent to them inviting them to take their audition. How do I purchase Sound Audition to use after my free trial? After the free trial, you can access our payment page to purchase single auditions or an annual subscription for unlimited auditions. You will want to be logged into your account when you checkout for payment.